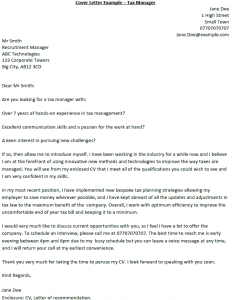 If you are looking for a Tax Manager job then have a look at our sample letter for your applications. Amend this example as suitable before sending it to employers. Over 7 years of hands-on experience in tax management? Excellent communication skills and a passion for the work at hand? A keen interest in pursuing new challenges? If so, then allow me to introduce myself. I have been working in the industry for a while now and I believe I am at the forefront of using innovative new methods and technologies to improve the way taxes are managed. You will see from my enclosed CV that I meet all of the qualifications you could wish to see and I am very confident in my skills. In my most recent position, I have implemented new bespoke tax planning strategies allowing my employer to save money wherever possible, and I have kept abreast of all the updates and adjustments in tax law to the maximum benefit of the company. Overall, I work with optimum efficiency to improve the uncomfortable end of year tax bill and keeping it to a minimum. 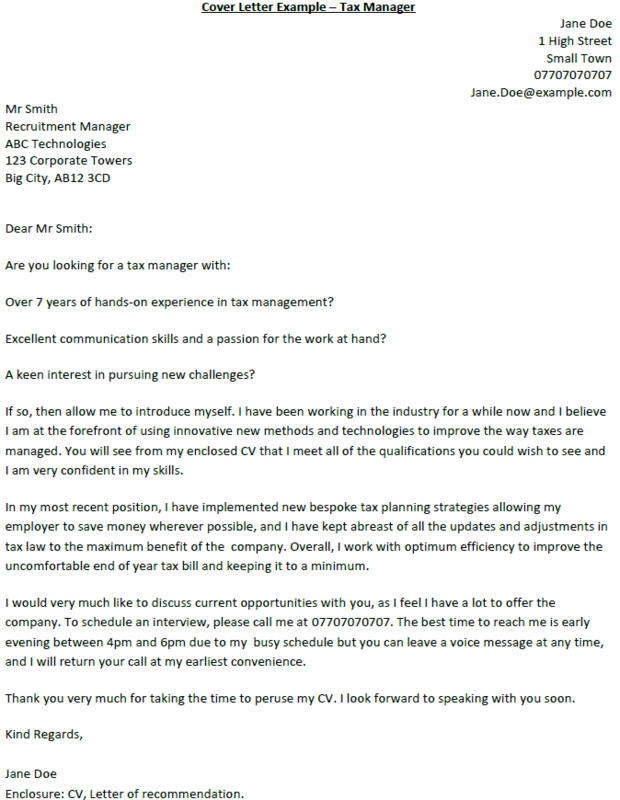 I would very much like to discuss current opportunities with you, as I feel I have a lot to offer the company. To schedule an interview, please call me at 07707070707. The best time to reach me is early evening between 4pm and 6pm due to my busy schedule but you can leave a voice message at any time, and I will return your call at my earliest convenience. Thank you very much for taking the time to peruse my CV. I look forward to speaking with you soon. Enclosure: CV, Letter of recommendation.